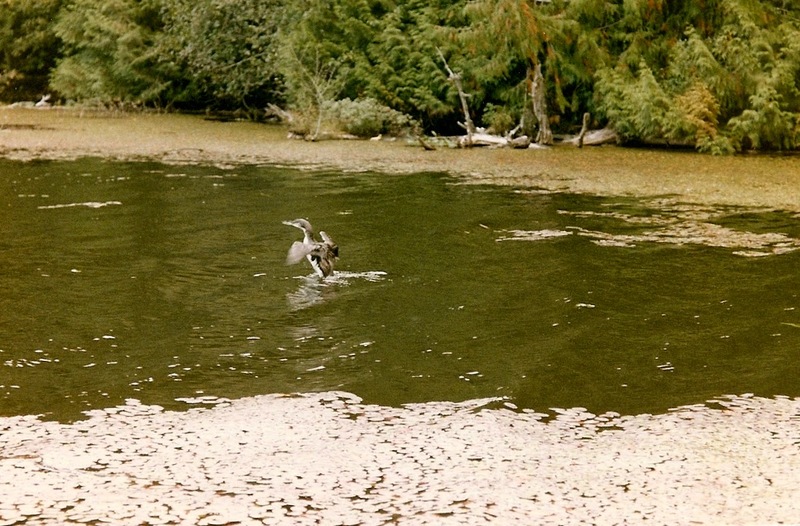 A stealthy rustle of feathers, a sudden gust of wind and the sharp-taloned predator cruised over the dark water. Scrambling for safety fat ducks and geese squawked in alarm, knocking over food dishes as they dove under nesting platforms. Then a miracle happened! The predator was stopped mid-air, entangled in the mesh netting strung above their pond. Frightened and angry the birds kept up the cacophony of sounds, screaming and shrieking at their helpless tormentor. A light snapped on in the nearby farm house and a slender woman sleepily stumbled outside to investigate the noise. “Dispatch, this is Kilo Three-Two-Five, on air,” I reported. We were responding to a call from the emergency central dispatch based in Vancouver BC. We were part-time ambulance attendants and volunteer firefighters living in a rural community, just twenty minutes away from the metropolis of the Greater Vancouver Regional District. “Kilo Three-Two-Five, this is dispatch,” the male disembodied voice came over the radio. “We have a report of a woman in need of assistance, please report to the following address,” he said reciting a descriptive address for a rural location. Lawrie activated the lights and sirens, and we headed out to a somewhat ambiguous call of a woman requiring assistance. What exactly were we headed into, we wondered. Arriving at a small farm we were greeted by the patient's sister who said, “She over there, beside the duck pond. She has a huge owl attached to her arm!” We hustled over to the woman who lay shivering on the damp ground. She had a very large and very agitated Great Horned Owl firmly clasping her forearm. Every time she tried to shift positions, to ease her pain, he responded by digging the sharp talons deeper into her arm. Lawrie grabbed a blanket from the ambulance and gently placed it over the woman as she explained how she ended up in this strange situation. She had heard loud and furious squawking from her assorted ducks and geese in the wee hours of the morning. Investigating she discovered that a large owl had become entangled in the protective mess that she had placed over the pond as a deterrent to winged-predators. Not wanting to harm the beautiful bird she thoughtfully tried to untangle his wings, only to find the bird instinctively reached for a perch to rest while she worked to free him. Her left forearm became the perch, and she was unable to dislodge the owl. In cold and in pain she sat on the ground, eventually laying down to ease the weight of the bird on her arm. Mid-morning her sister, who also lived on the island, had arrived to share a chat and a cup of coffee. The emergency dispatcher was notified, and we were sent out on the call. Ten long minutes later and another attendant drove up to the farm with a can of starting fluid. Lawrie sprayed a small amount on a gauze pad and held it over the beak of the owl. 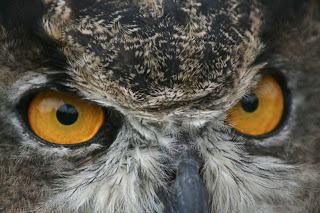 Seconds passed – and suddenly the owl released his talons and flopped over backwards onto the ground. Unconscious! Lawrie helped the woman up, and bandaged her arm. We looked at each other knowing it was pointless to argue. When a patient refused service, we couldn't force the issue. “At the very least you need a tetanus shot.” Lawrie said, as he had her sign the form declining assistance, then helped her to walk to the house. In the meantime I grabbed a blanket out of the ambulance and the two of us secured the unconscious predator, snugly wrapping its wings and talons. 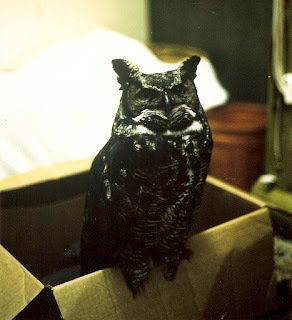 Carrying the bundled up owl, Lawrie climbed into the back of the ambulance, and I hopped into the driver's seat. We set off for the grocery store, hoping to find a large cardboard box to contain the owl until we could someone to take it off our hands. Beautiful boy - disorientated and spaced out on ether. I glanced back at Lawrie. He was nose to beak with a crossed-eye bird. 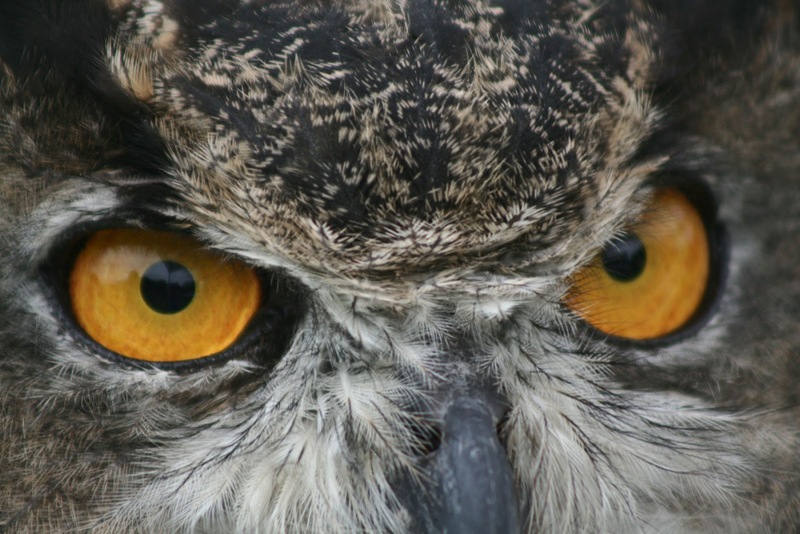 The owl's eyes swiveled back and forth as he tried to make sense of what had happened. “Sure. Hang on.” I chuckled, as I pushed down harder on the gas pedal. Parking the ambulance a bit carelessly at the door to the grocery store, I ran inside. “A big box, I need a big cardboard box. Quickly.” The clerk found one, handing it over with a questioning smile. “Why?” But I was already out the door and headed back to the ambulance. We quickly slipped out of the room, closing the door securely behind us. Now what? Fortunately for us one of the volunteer firefighters who lived on the island, and worked full-time in the city, was a bird specialist for raptors. We left a message on his answering machine explaining the situation, asking him to call us when he got home from work. 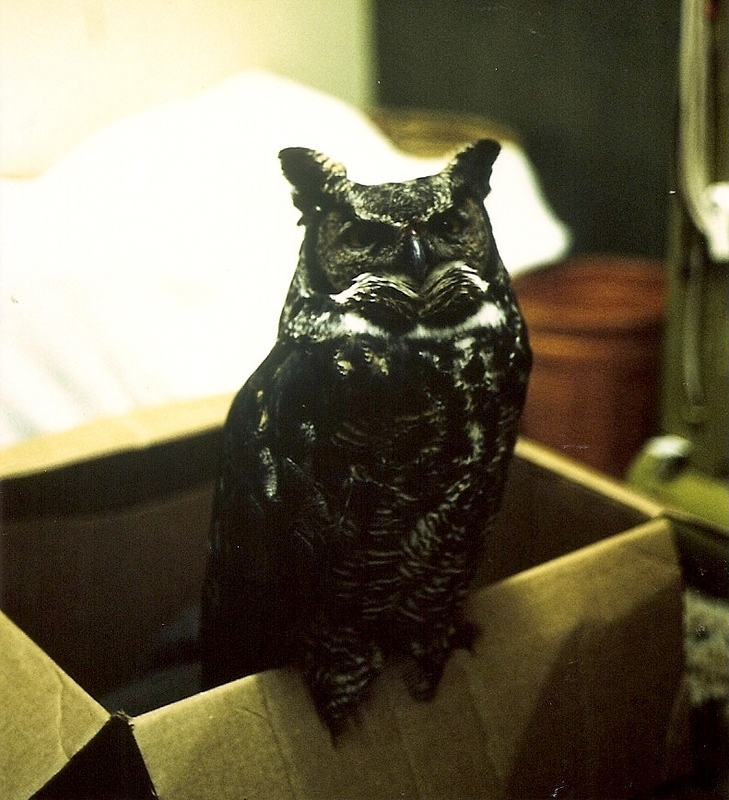 Later in the evening both he and his wife showed up at our house with their supplies and a cage for the bird. 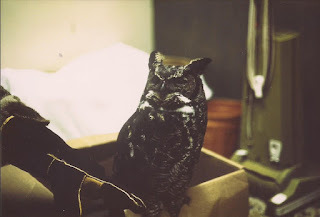 He offered a leather protected arm to the owl, and then expertly slipped a leather hood over the bird's head, before sliding him into the cage. Somehow I think the Winged-Terror had had enough of a seemingly free duck lunch. 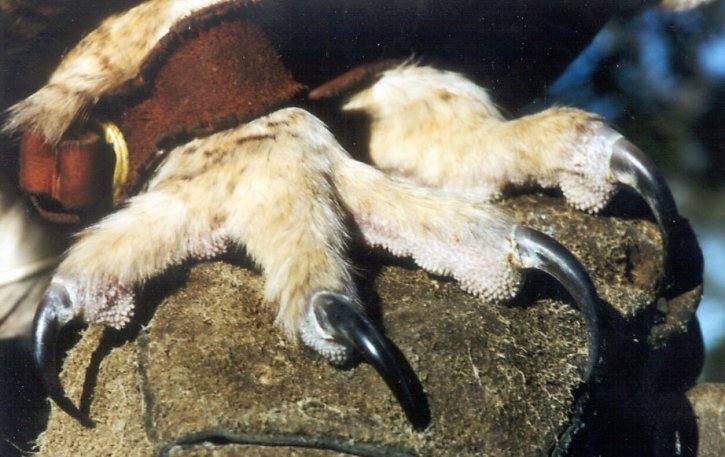 We never had the pleasure of providing emergency aid to him again, and the woman recovered very well except for the eight small scars where the owl's talons had punctured her arm. Please don't eat me! I'm all shell. Cautiously Hernando touched the new shell with his front claws, feeling for a trap. Or worse yet, perhaps a larger creature lurked inside hoping to catch him for its meal. Hernando gently turned the shell over, and over, exploring the edges and looking for flaws, or holes. It had black, and yellow, and white stripes with a gentle curl to the right, and a smooth interior. Hernando quickly pulled his slim tubular body from his current shell, and spiraled into the new one. It was a perfect fit, with slightly less weight to carry around, but with room to grow for the next year or so. And then the big hand reached for him again. The hand placed him inside different container where he again scrambled and clawed at the sides, hoping to escape certain death. Suddenly he was set back down on the sand near dozens of his friends. The others were enjoying a feast of tasty food, and bathing in clean shallow pools. Heaven, he was in Hermit Crab Heaven. It was the only possible explanation. Hernando’s first instinct was to scamper away and hide in the nearby bushes, but once he realized he was not being pursued - he stopped. He turned around, and re-joined the party on the beach. Scattered on the sand were dozens of shells in various sizes and colours. Straggly lines of Hermit Crabs, ordered from largest to smallest, clutched the next-in-line crab. Hernando knew what this was; he had experienced this many times. It was a shell exchange! As soon as the largest crab in the line choose a new shell, and decided that it was a good fit, it then released its tight grip on its current house, allowing the now empty shell to be taken by the next crab in the line. Eventually during the evening as many as eight or nine trades per shell would take place allowing most of the crabs to secure a newer and bigger shell. Some would be disappointed, not finding a better shell. Hernando knew that not having any shell was the very worst outcome for a Hermit Crab. The shells were necessary to protect their fragile bodies from being battered by the rough ground. They were also necessary to carry a supply of water, and to keep them safe from predators. Hernando had made do with a variety of objects in his ten or more years of life. (He wasn’t really certain how old he was. None of the crabs knew how to count and some of his relatives had lived a lot more years than he had.) In past seasons he had lived in a plastic bottle top, a glass pill bottle, and more recently a white jar that had held a smelly sticky substance before he moved into it. Life was tough for a Hermit Crab. But, he, Hernando already had a gorgeous new shell, so he ignored the shell line-ups and headed straight to the food. The thing was, thought Hernando as he munched his food, they were called Hermit Crabs, but really they were very sociable creatures. They enjoyed meeting up on the beach, touching and exploring with feelers and claws, identifying friends and family. The only time things got a bit tense was during the shell exchanges – some of the impatient crabs could get downright nasty if they didn’t get the shell they wanted. Occasionally a scuffle would break out, but it was quickly settled when one or the other of the crabs grabbed the shell and scurried away. Back at the Crab-i-tat, where the beach party was still in progress the Hermit Crabs gobbled down the free food. However there was always a downside to the free gifts. It was frequent and terrifying visits from the large creatures that inhabited this area, flashing their bright lights across the sand and shouting: “Oh, look at this one! He’s huge!” Well, he grudgingly admitted to himself, maybe he wasn’t all that scary to the big creatures. He was the one who had slammed his large front claw across the mouth of his shell, hiding, quivering in fear. After terrifying the wits out of him for a few minutes, they left him alone again to enjoy the rest of the evening with his Hermit Crab friends. He had survived another frightful encounter, and he was still getting bigger every year. PS: Hernando has had many visitors this year: Ethan, Evan, Kati, Emili, Kara, Nicolas, Carlie, and Chayne. He would like to thank everyone for being nice to him and his friends. I know I have written about Hermit Crabs before, but Hernando wanted to tell his side of the experience! I wrote this story about the life of a Hermit Crab in March 2013 for our Notes From Paradise blog. It is still one of my favourite critter stories. Well, this is a little embarrassing. I’ve been asked to tell you about myself, and really I am quite shy. I’m not prone to bragging. The beautiful brown-eyed blonde smiled impishly at her visitor. But, since you asked, well, here goes. When I was a tiny little baby I had five brothers and sisters. Our mother was taken from us quite suddenly so we never knew her. I was so tiny I would fit in the palm of a person’s hand. 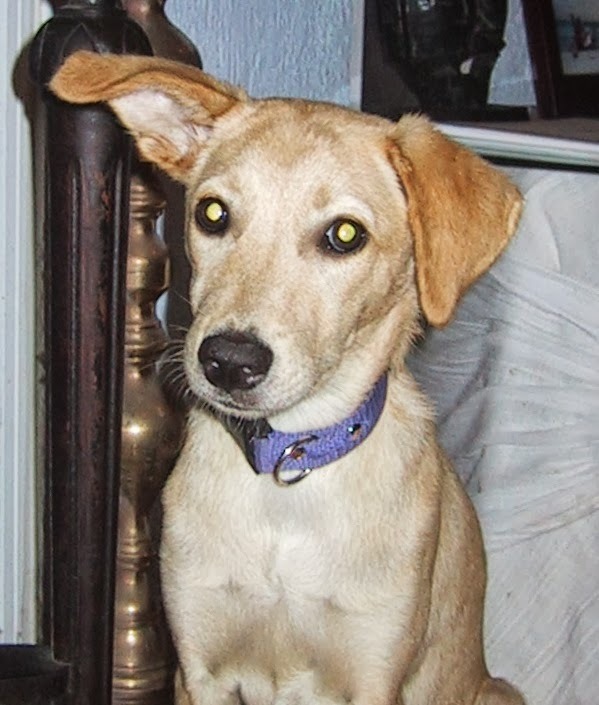 Bella’s feathery tail swished softly as she warmed to the idea of telling her story. One day just after the loss of our mother, a tall woman picked me up in her arms. Well, that made me very excited and I must admit I acted just like a very young puppy would, licking her face, and wiggling ecstatically. It’s all a bit embarrassing, really, but I was so happy to have someone love me. She is the person who named me Bella, which means “beauty” in Spanish and since we were living in Mexico it just made sense to have a Spanish name. One of her many friends thought that my name should have been Sandy, as I blended perfectly with the beach sand floors of their outside living area. I am very happy she stayed with the prettier name. I think it suits me perfectly, don’t you? She smiled, coyly. As I grew up it took me quite a few months before I could climb the stairs up to the apartment of my two humans. Because I had very poor nutrition as a tiny baby, I had very weak bones, and my feet would swell when I tried to run or play. My female human was so very patient with me, carrying me down in the morning, back up for an afternoon nap, down for playtime, and up again for bedtime. It really was a nuisance for her as she was also operating a busy resort. She kept telling me she loved me, and it was not a problem. Lucky for me she loved me so much! Her handsome male human was away a lot of the time working in another city, so we were good company for each other. Now, happily, he is here all the time and I love him as much as I love her. Well, maybe I love her just a teeny, tiny bit more because she carried me up and down the stairs. When I was learning my manners, my special treat was a few Cheerios, those little round crunchy circles that people float in a bowl of milk. I adore them. I will do anything for Cheerios. Learning my manners wasn’t a problem at all, it was quite fun, actually. I have also been told that I am very smart, so smart I even learned to love cats including my first friend Luna, and now my friend Peek-a-Boo. Luna taught me many secrets that only cats know. Peek-a-Boo and I have become good friends, and we patrol our property together. We keep an eye on our humans, and make sure their house is safe. Any strangers must pass our inspections, especially if they are working at the resort. Where's the fish? Where's the fish? Pounce! Some of my favourite activities include a game I invented – I call it pounce. It’s an exciting game. 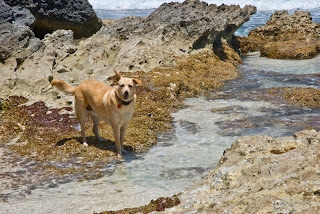 My humans take me down the path, through the dark, cool caves, and onto a smaller quiet beach. In the shallow tidal pools I watch very carefully for small fish. When I see them – I pounce! I wait, and I watch; then pounce again! I have been told that I look like a fox pouncing on a mouse when I play this game. I could play for hours. Peek-a-Boo would like to play with me, but she’s afraid to walk down to the beach with us. I also enjoy running on long sandy beaches at a place called Tulum. I’d run for miles, dash into the surf, roll in the sand, and then clean my face on a fluffy beach towel. It was a delicious treat. I am quite a bit older now, so I don’t do the long runs and hikes that I did when I was a much younger dog. Sadly I have had a few health problems in my past. The first problem occurred when I was about two-years old. I had a large tumor in my head that required surgery. The doctor did a fine job of removing the tumor, but as you can see from the photos both of my ears used to be perky, like wings. Now the right one is perky, and the left one is relaxed. It makes me much more interesting to look at, I think. I was such a scrawny, lanky teenager – all legs and feet. Now that I am a mature woman, I have settled into a fuller, Rubenesque-body type. I do have other health challenges including skin sensitivities, digestive issues, heartworm, and Ehrlichia, but I won’t bore you with the gruesome details. And of course as I age, I am gradually losing my eye-sight to cataracts. It is such a challenge getting older. I miss the carefree days of my youth. With such a rocky start to my life, being adopted has been a blessing for me. I gained a loving family, who feed me, care for me, and let me share their lives completely. And I’ll tell you a secret. She leaned closer to whisper. I have my own private closet filled with beautiful jeweled collars; collars for Hallowe’en or Christmas, or Thanksgiving, and for my birthday. I have collars to match my female human’s dresses, and my male human’s shirts. I am spoiled. And here's our recent family portrait ! They also let me share their bed for part of the night. I like to get into the bed first, kiss both of my humans good night and then leave to sleep peacefully in my own comfy bed. Part way through the night I will sometimes sneak into bed for an hour, or when my male human gets up in the morning I’ll make a warm nest with his pillows. Those extra few minutes of sleep are delightful, full of wonderful dreams and memories of being young again. I love my life. Bella looked away, a film of tears in her eyes, thinking how she had aged so much in the last year or two. I hope I can stay healthy and happy, sharing my life with my people for a few more years yet. I love my people. But her life was too perfect to be sad about anything for very long. Softly thumping her tail on the floor she grinned happily at her visitor. I wish every dog could be as fortunate as I have been! “Whew! What is that smell?” my dad asked, quickly winding down the driver's window on his 1955 Super-88 Oldsmobile. He quirked an eyebrow, looking at mom and the four of us girls, to see who had made that very un-ladylike odor. “Not me, not me!” we yelled back at him. Then all eyes turned to our dog, Danny Boy, who was blissfully unaware that he had caused a commotion. “What? Why are you looking at me?” his expressive brown eyes seemed to say. “I'm just enjoying our Sunday car ride.” He poked his head over Dad's shoulder, out the open window searching for fresher air. 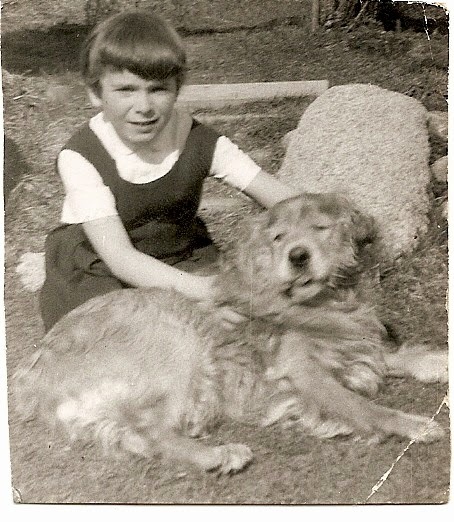 Danny Boy, a Golden Cocker Spaniel, came into our family the same year I was born. We quickly became inseparable. 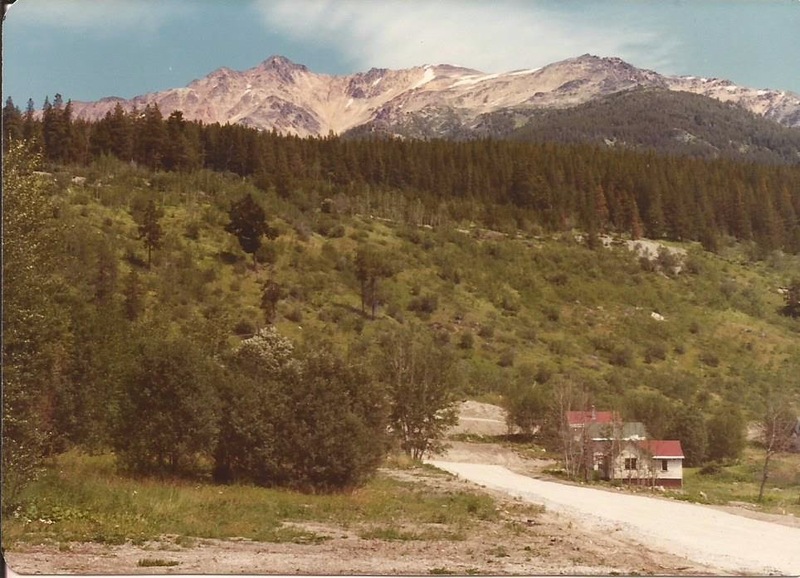 When I was about six or seven years old I started exploring the hills behind our house in the upper town-site of the gold mining town of Bralorne. Danny Boy stayed by my side as I picked a variety of wildflowers, a present for my mom: the fuzzy red Indian Paint Brushes, delicate mauve and white Lady Slippers, the yellow and purple Honeysuckle, and bright orange Tiger Lillies. He hung out with me while a group of young friends and I fooled around the with discarded mining equipment. The group quickly discovered that we could make the body of the rusty old oar car spin around and around, while the four wheels stayed stationary. It was an impromptu merry-go-round until one of our friends, Nadine, slipped between the rapidly spinning body and the stationary frame, painfully snapping her femur. No more merry-go-round. Danny Boy was with us, but it wasn't his job to control our goofy antics, he was there to make sure I could find my way home at the end of the day. 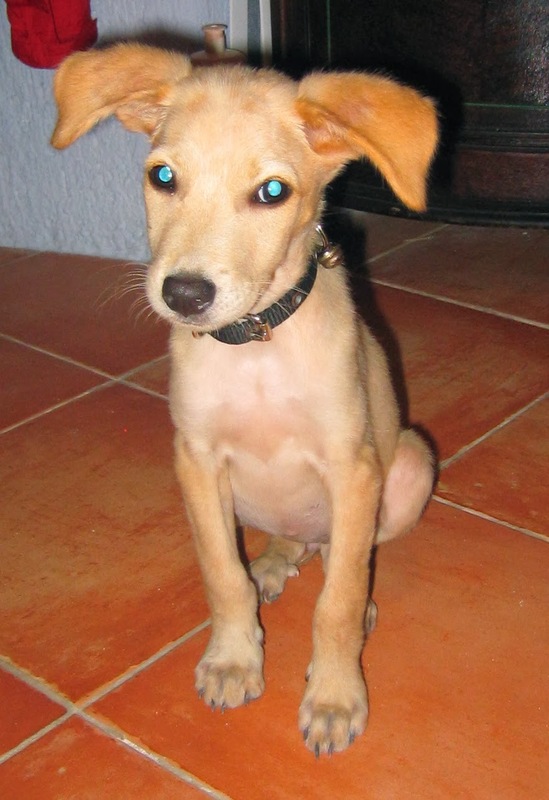 He always accompanied us on our family outings, hanging his head out the car window with long ears flapping in the wind. 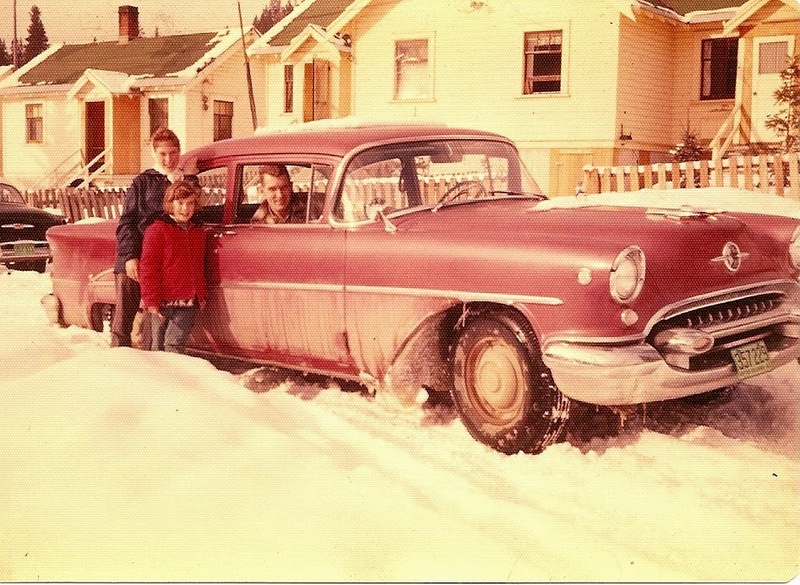 In the 1955 Oldsmobile he preferred to stand behind our dad with his feet on the armrest and the window open wide. He was just as happy in the back of a pickup truck, as long as he had one the girls to keep him company as we bounced over rough mountain roads. My cousins Rob & Ken, and I. 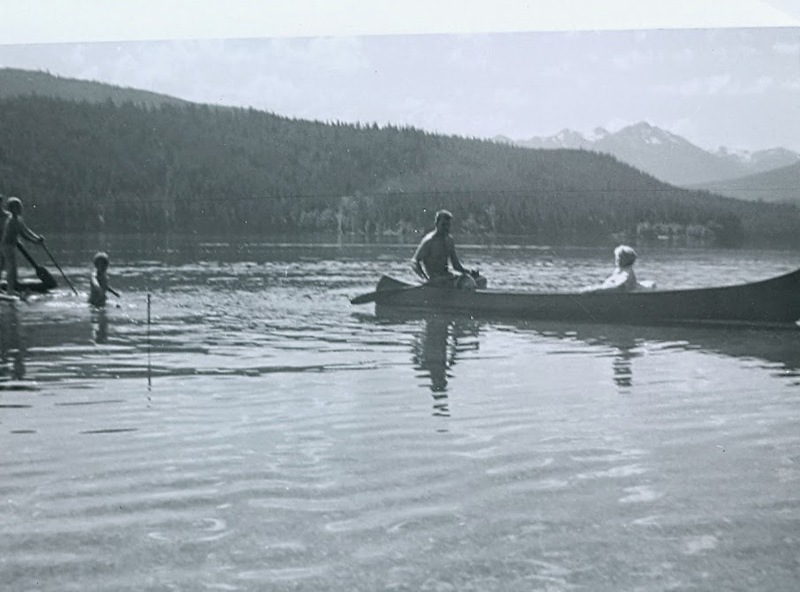 Dad and Granny in canoe - no dog! But the one thing Danny Boy would not do was swim! He hated water. I can still hear the frustration in my dad's voice, “He's supposed to be a retriever for heaven's sake! And I can't get him to go in the water.” So we swam in rivers and lakes, and the dog watched from the shore. No amount of coaxing was going to get him into the water. As for retrieving, nope not going to happen. In his mind watching four active girls was work enough, he didn't have time for other jobs. 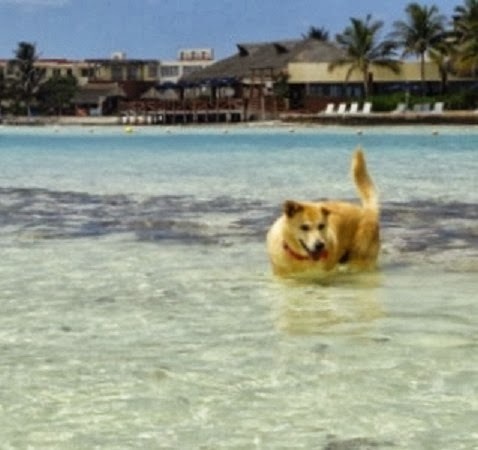 Along with his refusal to swim was the persistent problem with flatulence. It wasn't until years later that I found out the cause of the problem. Raw eggs! Our parents had taught us to put a raw egg in his food, to make his coat shiny. It turns out the raw eggs cause flatulence for dogs – especially for Cocker Spaniels. The poor guy never had a chance! I will always remember him as a fun, faithful, and somewhat stinky, friend. 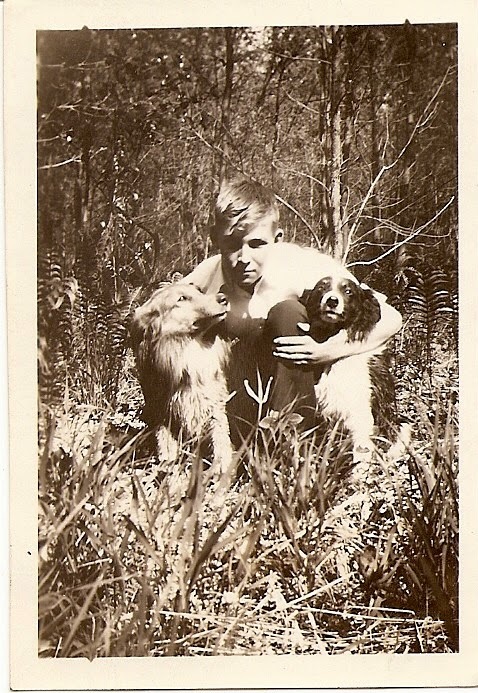 Dad as a youngster with his dogs. We found the bird, close to death, collapsed on the shoreline of Bowen Island BC. She didn't resist when I bent to pick her up, tucking her into a sweater for the ride to our house. Loons are large, beautiful waterbirds native to the northern hemisphere, nesting on lakes and rivers and returning to the ocean for the winter months. They have strong, straight bills that can quickly spear an escaping fish, or unwary human hands. 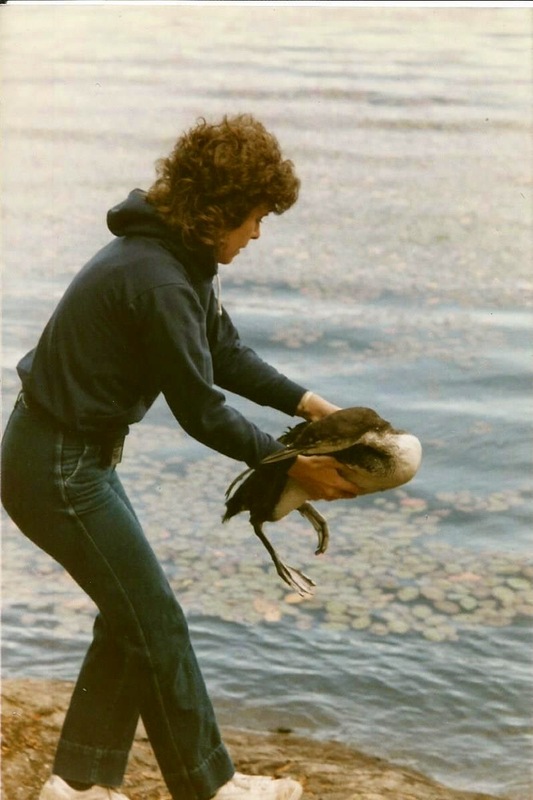 Loons have large feet, and short wings, necessitating a long awkward run on the water's surface to become airborne. Anyone who has grown up near a lake or river is probably familiar with their hauntingly beautiful cry. As it turned out, squirting the liquid into the sick bird was a two-person job; one to hold the bird and her sharp beak still and the other one to squirt the goo. First one week passed, and then another. By now our resident loon was feeling quite perky. We were able stop force-feeding her, instead we tossed pieces of fish towards her. She caught the food mid-air and greedily gulped it down. The local marina operator was amused at how much we were spending on herring and other bait fish, especially since we seldom, if ever, went fishing. At the end of the second week we decided to move her into our bathtub so that she could exercise, and preen her feathers in preparation for release. Whenever we heard Claire de Loon call her weirdly thrilling cry, I would quietly crack open the bathroom door to see what she was doing. The sound would stop! When I shut the door – she would start up again. She was missing her mate, missing her freedom. It was time, time to let her go. We tucked Claire de Loon into a cardboard box, and drove to Killarney Lake in the centre of Bowen Island. It was a perfect place to let her recover her strength. She had fresh water to drink, a big lake for swimming, and lots of fish and aquatic critters to feast on. It was loon heaven. I released her, expecting her to fly away from her captors as quickly as possible but we got an unexpected thrill. Claire de Loon stayed nearby for at least ten minutes, trilling her call, doing a loon-happy-dance on the lake! She was happy! We were happy. Watching her brought tears to my eyes. 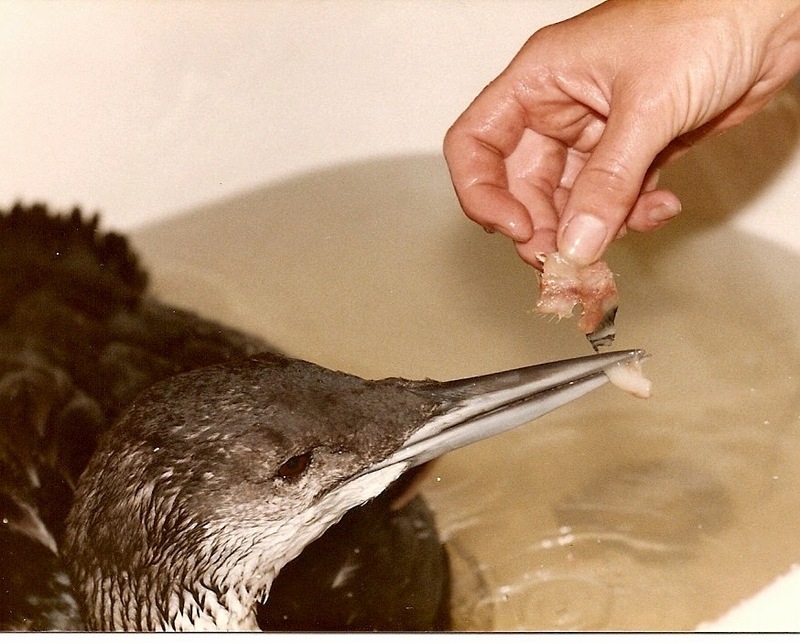 Later in the day when we were scrubbing out the bathroom to make it useable for us, we discovered the downside to letting a loon recuperate in your bathtub. The acid in the loon poop completely removed the enamel surface of the tub. Ah well, it was worth it to see her healthy and happy. Dance on Claire de Loon, dance on. And he did. With that simple action, Buck, my six-year-old black Labrador Retriever won a spot in my man's heart. 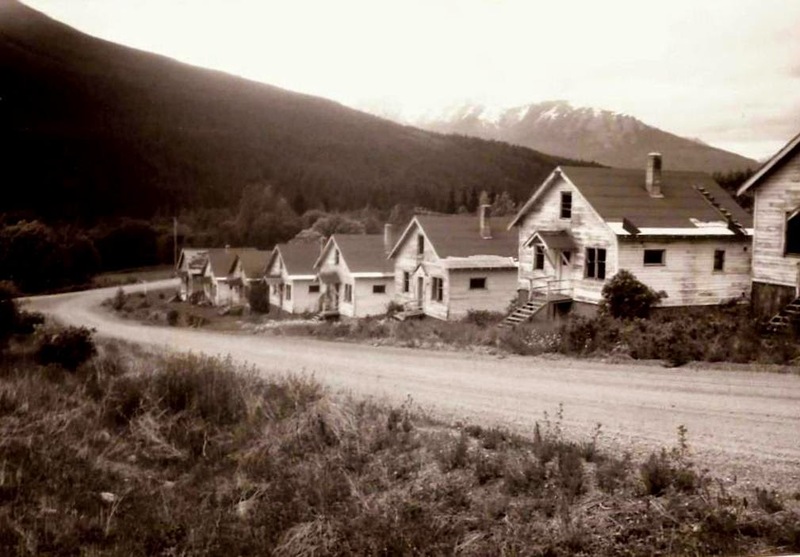 Lawrie and I, and his then eleven-year-old son John, were spending a three-day weekend near Bralorne, the remote and almost-abandoned gold mining town where I was born. 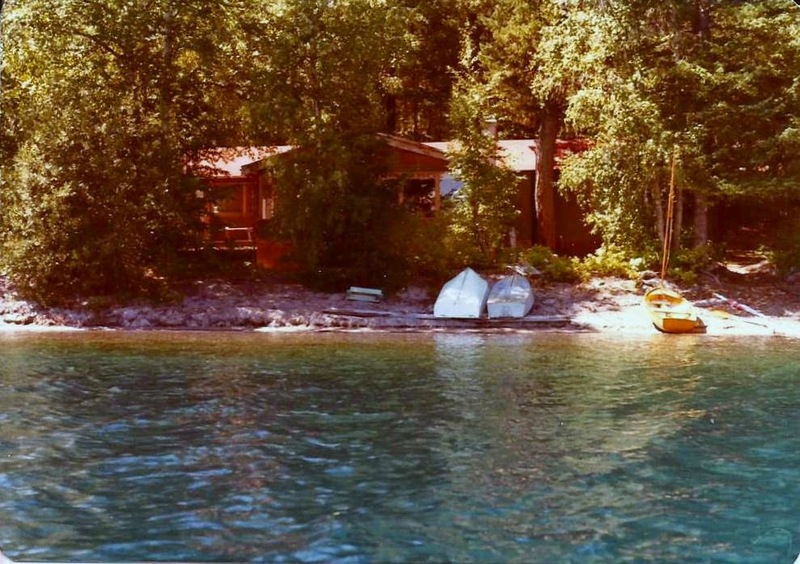 We parked our camper truck under the pine trees at our original family cabin situated on the shores of the glacier-fed Big Gunn Lake. Lawrie wanted a cold beer so he decided that he should toss the entire case of beer out into the lake to cool it down. A half an hour later when Lawrie tried to retrieve a cold beer he discovered his mistake. Freezing cold water. Too damn cold - unless you happened to be a young kid who grew up swimming in that lake. He looked calculatingly at my dog, Buck, who was sitting beside us, tail wagging and tongue lolling out of his mouth. Lawrie took a small pebble and tossed it into the water towards the case of beer. “Buck – go get me a beer!” he commanded. Buck, always eager for a swim jumped in the water and swam to where the pebble had disturbed the surface of the lake. He paddled around in confusion, then to our surprise dove down, leaving just the tip of his tail poking above the lake's surface. A minute or two later he popped to the surface with a beer in his mouth! Wow, Buck the Wonder Dog! Clutching the beer in his teeth he swam to shore where he was greeted with hugs and love and praise. 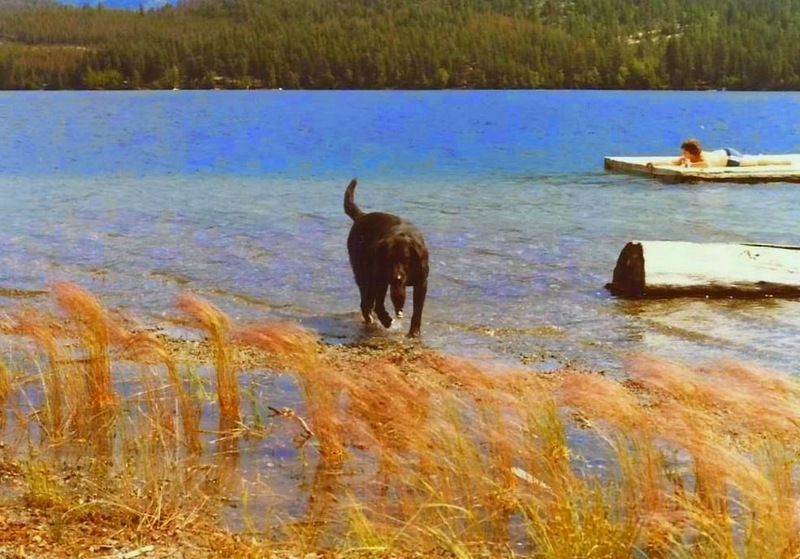 “Good dog, good dog!” “Now, go get Lynda a beer,” Lawrie said, tossing another pebble into the lake. Off he swam, no confusion this time, diving down and retrieving a second beer. His arrival on shore was greeted with more hugs and praise. And he did, every time – until three days later when our short vacation was over. Revenge and Romance. Murder and Mayhem. And a hunt for pirate treasure on a tiny island in the Caribbean Sea. 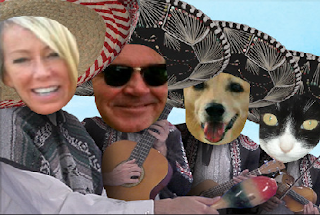 Join a quirky cast of characters and a lovable rescue dog named Sparky. SILVER AWARD WINNER AT INTERNATIONAL LATINO BOOK AWARDS 2016, $15.00 USD plus shipping. 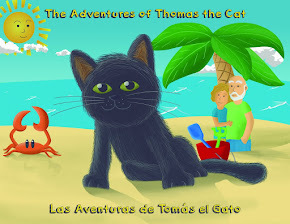 Wonderful tool to teach children about another culture while learning a second language. 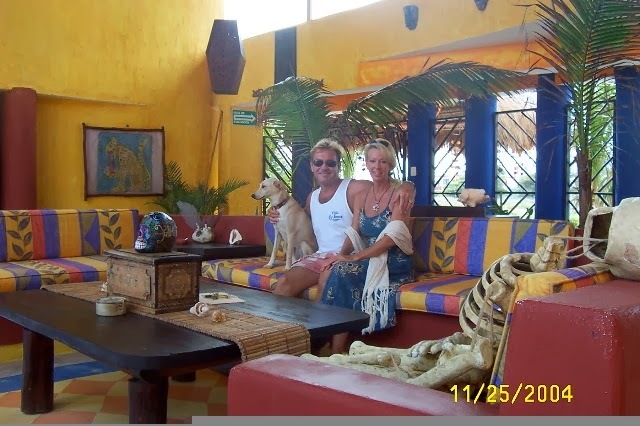 Purchase your copy on Isla Mujeres at Jenny Penny Designs, or at Marina Paraiso hotel lobby or by contacting the author via this blog page or FaceBook. EBOOK COPIES $2.99 on Amazon! Give us a try!